A terrific biography of Florence Nightingale and her family, from a feminist perspective. It’s the kind of detailed biography I love, with little side trips into politics of the day, family history, and military detail.At the age of 17 FN had a religious experience that convinced her she was to have a life of service to God. From that point, she sought to be trained as a nurse or in the administration of an institution like a hospital. As one would expect, her upper middle class family tried to keep her at home and close within the family circle. Much of this book is about Florence’s power struggles with her parents and with other members of her large extended family. For a young woman of her class to become a nurse Just Quite Simply Wasn't Done. But by the time she had taken charge of a home for retired governesses, and then was asked by the government to lead a party of nurses to the army hospital in Turkey, her parents and sister were proud of her, and continued to support her in extraordinary ways for the rest of her life. Her father supported her financially so that she could live independently, unusual for the time even among well to do people. Unmarried daughters were expected to live with their parents.Because her family was wealthy and socially popular, when she went to the Crimea she had the ears of many powerful men. Eventually it was her skill at organization, more so than her nursing skill (which was considerable) that enabled her to make changes in the way the wounded in the Crimea were treated, and in how the Army dealt with its casualties. She spend two years in the Army hospital, then for the next fifty two years was virtually a recluse, rarely leaving her home. But during that time she was busy writing, advising, influencing. That is her true legacy.She had many close women friends but made women enemies, too; she could be clumsy at leading women. Gill makes the interesting observation that most women in this era had little experience of working in collaboration and tended to identify themselves as individuals rather than colleagues. “Discipline, collegiality, and team spirit were not qualities society asked of its women.”The author is British and gets in some good snarky remarks. “History, as opposed to imaginative literature, is based on evidence, and no one has produced any evidence that Florence Nightingale ever engaged in sexual relations with women. This I assume to be the standard working definition of a lesbian.” About Richard Monckton Milnes, said to have been the man who Florence loved but sacrificed to her vocation (Gill refutes this): “In Turkey, Milnes was invited to a pasha’s dinner party at which the guests were entertained by Greek dancing boys dressed as women. In a letter to his mother, Richard noted that the dance became increasingly ‘lascivious and violent.’ [Biographer:] Pope-Hennessy summarizes: ‘The dance ended with the Turkish guests getting thoroughly involved with the Greek dancing boys. Milnes who had had too much to eat said he dropped off to sleep.’ As a fellow biographer, I can only admire the delicacy of the expression ‘thoroughly involved’ and the positioning of the word ‘said.’”She’s written biographies of Mary Baker Eddy and Agatha Christie and just did a book about Victoria and Albert. I’ll be looking for these. I cannot tell you how suprised I am to have liked this as much as I did. Before picking up this book, I had little knowledge and less interest in the saintly nursing pioneer and got the book only because I had enjoyed another Victorian-era biography by the author, Gillian Gill (We Two: Victoria and Albert, Rules, Partners, Rivals). As it turns out, Nightingale is actually an incredibly fascinating figure--brilliant, highly cultured, moody, wildly charismatic, fiercely ambitious, and just crazy enough to keep things interesting. The writing style is very compelling and novelistic, with an expansive view of the society at large (think Erik Larson). I'd recommend this to anyone with an interest in the Victorian era, even if they think they have no interest in Nightingale--the myriad details about her liberal, reform-minded, highly educated upper-middle class family in that time should be seriously fascinating for any lover of Victoriana. Nightingales by Gillian GillThis very well researched and documented biography of Florence Nightingale gives the reader an intimate look into the family, the culture, and the times that shaped the life and character of Florence Nightingale. The author pulls extensively from the voluminous correspondence to and from Miss Nightingale to give a fuller, richer portrait of the "Lady with the Lamp." The severe restrictions on Victorian women, the entail of the family estate, and a call from God to serve came to shape the brilliant mind and life of Florence Nightingale. It is an excellent book for anyone wishing to understand more deeply the influences on Miss Nightingale. I have only two criticisms and these are perhaps more indicative of my own preferences. First, the author goes into excruciating detail about the extended family and not only the extended family but extensions of the extended family. This was very hard to follow for one not already well versed in the Nightingale family and served no useful purpose. Second, the author presents long sections of letters and I found the intricate Victorian prose again very hard to follow. However, I don't want to take away from the fact that if you are looking for a solid biography of Florence Nightingale, you could do no better than this volume. Excellent read for many reasons, though primarily a view into a woman's world where she sacrifices artifice of life for punishing hours of nursing. What makes the book worth reading is the struggle Nightingale had with parental control and the period restrictions on a woman's potential for growth at a great cost.Once she gained her strength to walk from the life her parent's wanted for her, Florence Nightingale possibly felt her work giving her means and measures for getting out of her own limits. Her philosophy reached a world that was made up of men and established values. Social changes, war destroying men's bodies and intellectual future existence in English society. Horror came to her and she did not run from the disasters. I have not been a reader of biographies when younger, but now that I am more mature, and because I have always loved history, I am reading at least one biography a year, about persons who I may only have a general knowledge of. What a GREAT biography this was to read. Chapter notes, annotations, detailed, and written like a novel - you almost forget you are reading someone's life history. I know little about the Crimean War, but I did know Nightingale was responsible for changes made in public health care because of her work in England and then in a war zone, all during the reign of Queen Victoria. I have read that great social change occurred during Victoria's reign, and Florence Nightingale was one of the reasons for it. I trudged, I crawled, I wormed my way through the first 300 pages...and then it got interesting, really interesting and yes, it was worth the effort to arrive at a Florence Nightingale who was whole and real, not just the mystical "Lady of the Lamp". To read what this one woman accomplished in her lifetime makes the rest of us look like slugs. Her behind the scenes activities were notable, her ability to deal with people of all backgrounds was remarkable--and her sharp words when she was not getting what she felt she should have was alive and well, too. Yes, I'm glad I made it through all 465 pages, though I passed on the 80 pages of notes and acknowledgements, etc. Enough is enough! Well researched, thoughtful conclusions. I couldn't keep the timeline straight, which made character development difficult to follow. The ending was not satisfying. No nurse's historical background is complete without reading about Florence Nightingale. I personally didn't know much about her, just that she was considered the founder of nursing, and that she was known as the Lady with the Lamp. The book begins with a detailed genealogy of Flo's parents and their families... which seemed boring to me but does have relevance later in Flo's life. One of the major familial themes has to do with the inheritance law in Great Britain at the time - since women could not own property in their own right, the ladies in the families were desparate to produce sons in order to preserve their own lifestyles. This sets the stage for Florence's mother's complete outrage when Florence refuses to marry. Florence had a sister, but no brothers, and so after the death of her father, her mother was out on her ear. Okay, not literally, but one of Flo's cousins inherited the family estate because Florence's mother could not legally inherit her husband's property.Anyway, about the nursing stuff - it seems that Flo was always a very religious and very sensitive, guilt-ridden child. She decided quite early in childhood that she wanted to care for needy creatures, and took in countless pets. She also cared for her sister and her cousins (she was very close with many of her cousins) when they were ill, and seemed to take great pleasure in the act of caring. One theme that cropped up over and over in Flo's private writing was of her overwhelming guilt about some unnamed bad thing that she felt compelled to do over and over. I crassly interpreted that as masturbation, but the author believes that Florence had a deep tendency to daydream or fantasize, which took her away from the concerns of the material world, which caused her tremendous guilt. Oh, right, the nursing stuff. Florence insisted on taking nurse's training, which caused her upperclass family no end of grief. At that time, nurses were either nuns (and the Nightingales were Protestant) or else they were "working girls" who were alleged to be drunken prostitutes and lousy patient advocates. Florence refused to back down and eventually her family gave in, reluctantly. After training, Florence immediately took on an activism role, advocating for sanitation, a healthy diet, and peaceful surrounding to help patients heal. During the Crimean War, British soldiers in Turkey were dying hand-over-fist, and with the help of her family's connection, Florence managed to get herself appointed to the hospital treating the wounded at Scutari. She loaded a ship with medical supplies that she convinced wealthy friends to donate, recruited a staff of women to train as nurses, and took off for Turkey. The Army's medical director was not impressed with Florence's demand that he give over operations of the hospital to her, but eventually changed his mind after she sat, mule-like, out on her boat in the harbor and refused to hand over the medical supplies.Once she got inside the hospital, Florence insituted all kinds of changes. She insisted that each soldier needed his own bed with clean linens. She demanded that the dressings on the soldiers' wounds be changed regularly, and the wounds washed with soap and water and redressed with clean bandages. She insisted that the kitchen be sanitized, and that all the soldiers required a healthy diet to be able to heal. And most of all, she showed the wounded men that she cared, personally visiting each one of them. She got the name "The Lady of the Lamp" because she carried around a small lamp as she walked the wards at night visiting soldiers who couldn't sleep or needed comfort.There's a lot more that Florence did to advance the profession of nursing. But since I'm not writing my own book on her, I'm going to stop there. I was looking for an in-depth view of Miss Nightingale's upbringing and education. Got little snitches of it, but this book focuses mostly on relationships and psychological effects.Presented a more just view of her mother and sister, I felt.She had a harsh governess and was away from her parents a good deal for about 2 1/2 years before age 10. She felt from a young age she was different, in a bad way, and was afraid of making mistakes in front of people.Wanted to impress her parents. Did not feel as excepted by her mom (she was not as feminine, it would have helped their family if she had been a boy) and compared herself to her sister. (but they got along a lot better than I had previously thought)My favorite part is that her father educated her and her sister, and that these were her favorite years, from 10 to 17? This was unusual- Victorians felt it was bad for women to get an education- would make them unfit mothers and less desirable as potential wives? Made me furious to read that. Her father believed women should be educated, and he also was in need of an interesting project and intellectual companionship.Favorite quote- "[their father] developed lesson plans and excercises for his daughter-pupils and he expected them to work hard, but he was not all rote and routine like Miss Christie [the previous governess]. His essential pedagogy was to offer to teach his daughters what he knew and then wait to see how they responded. If they made progress, he became more engaged; if they failed to show interest or commitment, so did he. Since both girls proved to be worthy pupils, full of intelligence and application, a positive synergy grew up around the lessons. "Would have loved details into this aspect of her education- this is what I was looking for, as well as moral up-bringing and daily habits, and didn't find. I thought this was a good biography, though not a perfect one..First of all, pay attention to that subtitle. Gill focuses heavily on Nightingale's parents, her childhood, and her young adulthood. Out of 21 chapters, we don't reach the Crimea until chapter 15. Once we leave the Crimea, less that fifty pages (two chapters) are given to the second half of Nightingale's life from 1856 to 1910: the decades of her incredible writing campaigns and her ambitious programs of reform. 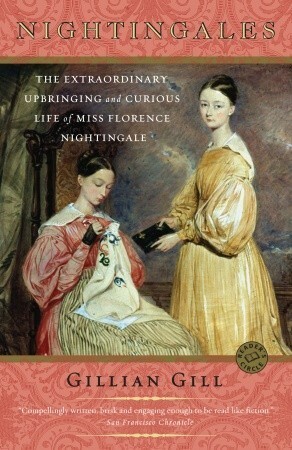 Once Nightingale wins adulation and retreats to her bedroom as an invalid, Gill seems to lose interest.That said, Gill does a great job of illuminating the personalities involved, not just in Florence Nightingale's immediate family, but in her broad circle of friends, contacts, and acquaintances. Gill is sympathetic to Nightingale's contemporaries. She puts in the effort to place them in the context of their day, as well as present both the good and the not-so-good aspects of their character. The book does read like a novel: you feel like you know these people by the time you've finished, and you'll get angry at the systematic injustices catalogued.There were a few stylistic choices I thought a bit odd. Every now and then, Gill lapses into the first person as she speculates on reasons behind the Nightingales' actions. Gill will also jump about in time, skipping back and forth a few years at a time. At one point she spends an entire chapter referring to Florence's sister's husband before she backs up to explain how the previously unweddable Parthe landed a rich and titled husband at age 40. "Through the facts [Nightingale] always saw lives," writes Gill, author of books on Agatha Christie and Mary Baker Eddy. Such is also true of Gill, who abandons historical speculation in favor of fastidious reliance on diaries and letters from Nightingale's family, friends, and colleagues. Although one of many existing biographies, Nightingales is one of the first to thoroughly examine the relationship between her public and private life. Besides vividly evoking Austenesque mores, Gill creates full-blooded characters, from a sickly sister to a dilettante father. Critics disagree about Gill's tone; while novelistic, the constant use of "I" distracted some and edified others. Similarly, the myriad details both add and subtract from the narrative. Yet, on each page, Nightingales offers a unique perspective on the Bird's fascinating life. This is an excerpt from a review published in Bookmarks magazine. A flurry of facts and facets about Florence. "Florence in particular, from an astonishingly early age, seems to have been writing for an audience." pg 81I would love to know what happened to Felicetta Sensi. The fact that Florence got her enrolled in school and payed for her education out of her dress money really tell you what an amazing Christian lady Florence was.Truly astonishing, to see the understanding Florence had of epidemilology before she even knew what a germ was. pg.334An organized woman can truly change the world!Of course, I loved it when they called in a gourmet French chef to feed the troops and they started to thrive. Gotta love the cooking stuff. pg. 380I also want to know what happened to the three boys she brought home from the war? She went into hiding for the next 20 years, so who took care of them? What happened to them? Did they stay in England? Grow up successfully? These were questions unasnswered in the book. I'm glad Gill made her approach from the angle of Nightingale's private life. We have enough bold-faced stories about her famous subject, now let's hear what was happening from Nightingale's own pen and the pens of those she loved.Make no mistake, there is plenty of interesting material here. I was never interested in Nightingale as a biographical subject until I read some of Elizabeth Gaskell's work (she was Nightingale's contemporary). I found myself moved by what happened to Nightingale during the Crimean War, much more so than if it had been a fictional account. I wonder if anyone has ever considered that her withdrawal from life afterwards may have been partially a result of PTSD?Gill doesn't let her off the hook about her bad behaviour, examples of which there are plenty. This is not hagiography. The best part of this book was the depth with which the author explored Nightingale's upbringing and family. It really brought together a complete picture of the woman and her life/mission. Florence Nightingale is way more than just "that famous nurse." She was really a person both of and ahead of her time, and if that sounds like a contradiction, Gillian Gill does an excellent job of illuminating just how it happened. My only complaint--the author really loves her thesaurus! I have a relatively large vocabulary, and I'm not above throwing out two dollar words when it suits a situation, but I had to use my dictionary more for this book than for any other! It got to the point, for me at least, where it felt like Gill was trying too hard. Minor point of complaint though...the subject matter more than made up for it! this lengthy biography of Florence Nightingale was fascinating. There was almost too much information about extended family, but the author used this voluminous research to provide background about society in England in the first half of the 1800s, and then the reader realizes the norms that Florence was bucking when she set out for the Crimea. She had love-hate relationships with many people in her life, but ultimately remained true to her mission of nursing the sick, injured, maimed and dying. The last 30 years of her life were largely spent in her bedroom, confined by an illness that some modern minds now think was brucellosis, acquired from drinking goat's milk in the Crimea, as a supposedly safe alternative to contaminated water. This book emphasizes Florence Nightingale's remarkable family and her upbringing. Ms Gill starts with information on her great grandparents and continues with the succeeding generations.I don't mean that as a criticism. the whole family is interesting.Ms Gill says repeatedly that Florence's parents were very progressive in their child rearing methods. However her mother clearly punished and pressured Florence to become a little version of herself. It is my impression that this treatment did her permanent damage.The books only goes as far as her service in the Crimea, though there is a short summary of her life after that.The book is well researched, well written, and comprehensive for the time period covered. I enjoyed spending time with the Nightingales. This is a book rich in details of life in Victorian England, well researched with numerous references. Also of interest are political and artistic characters now historically significant, and descriptions of social situations that brought them into Florence Nightingale's life. The description of Victorian society amongst the upper class explains why Florence was unable to act independently and fulfill her ambition for a nursing career until she was in her thirties. She struggled not to waste her life in what she saw as the frivolity of the female role within the traditional confines of an upper class marriage. There are many ways life in the 1800s was different from today, but also alarming similarities. Quite a compellingly-written book about not only the eccentric and formidable Florence Nightingale but her oftentimes conflicted but tightly-knit relationship with her family. Ms. Gill dissects Florence's family life and its impact on her development as thoughtfully as any careful researcher but throughout the book you can tell that in spite of Florence's very human deficiencies Gill honestly likes Florence -- and her family. She appreciates Florence's cutting wit, admires her implacable drive and winces at her outbursts of melodrama and thoughtlessness. But though Gil winces she doesn't flinch from drawing out a real person filled with her shadows--as well as light. First rate biography of Florence Nightingale and her amazing family, all of whom were interesting - eccentrics, knew everyone, politically active - and the author is a figure in the story as well, as she shares her takes on the Nightingales. Gill has also written a great book on Mary Baker Eddy, who founded Christian Science. Intelligent, well written and rather quirky biographies are Gill's specialty. I highly recommend everything she has written. her books are quite long, but compelling - I read this very long biography in two days. I enjoyed this book a lot! If you're into the 19th century, the Nightingales are so well-connected that this book reads like a who's who. In the family tree, you can even figure out how Helena Bonham Carter is related to Florence Nightingale! Gill paints a lively, sympathetic picture of the often dysfunctional family. Loved her pacing and touches of humor. Is it worse to be a living legend or the sister/father/mother/cousin/niece of a living legend? The scenes in the Crimea are not for the faint of heart or stomach. Meaning, I loved them. It really was fascinating. Well, at least the first third was. I couldn't get through it, I just couldn't. And after not reading it for book club after a month and a half, after all my extensions at the library had worn out, I decided just to take it back and maybe try again another time. It really was a fascinating read, so well researched and incredibly well-written, just not real engrossing. Next time. Next time I'll pick it up and get through it. Next time. Love loved it. I love WEN. For a Eurpean Victorian man, he went against what was expected and where society led him. He taught his daughters, not only taught them but thoroughly instructed them in law, Greek, Latin and extensive history. When society mores taught him to view his daughters as lesser humans he maintained their individualism and independence. He gave Florence a salary and let her live away from home. Unheard of at that time. FN was who she was because of him. An excellent read about a fascinating person. Other reviews describe this book as a "novelistic biography," which I found to be true. It's very readable, and provides well-researched information as well as clearly identified interpretations or theories about Nightingale and her life. The abundant details about Nightingale and her family provide a strong sense for the person she really was--driven, competent, charismatic, conflicted, and complex. A highly recommended read. Probably the thickest book i ever read... i loved this story because you learned of a wealthy family and how they lived and the small faith that grows within Florence and the simple love she has... being all alone through her life and how she deals with it.. was a good book that took me a while but glad i read it. I read this book after Gillian Gill's excellent "We Two" (the story of Victoria and Albert). And I was not disappointed. Gill mines a tremendous amount of correspondence to inform her writing, but the book is never dull. A wonderful biography of a woman who played such a major role in the development of our modern health care system, at a time when women were not encouraged to be leaders. I read this while I was waiting for Gill's other book, We Two, to come to my library. Another really detailed account of life in the nineteenth century. I really enjoyed learning about the then-medical establishment's growth in terms of infectious disease treatments. Also the info about Florence Nightingale's big family said a lot about Victorian society.